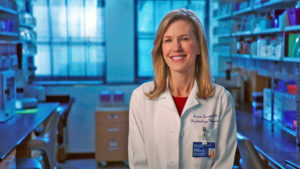 Susan Quaggin, MD, chief of Nephrology and Hypertension in the Department of Medicine and director of the Feinberg Cardiovascular and Renal Research Institute, was the senior author of the study published in the Journal of Experimental Medicine. Northwestern Medicine scientists have identified a new therapeutic target that may help protect kidney function in patients with diabetes. The study, published in the Journal of Experimental Medicine, demonstrated in a preclinical model that inhibiting a protein called VE-PTP preserves microvascular and kidney function in diabetic mice. Susan Quaggin, MD, chief of Nephrology and Hypertension in the Department of Medicine and director of the Feinberg Cardiovascular and Renal Research Institute, was the principal investigator of the study. Diabetes can cause injury to the small blood vessels of the kidney, eventually leading to kidney damage. In North America, diabetic kidney disease is the most common cause of kidney failure, and rates of disease are expected to only continue to grow. As such, there has been significant interest in developing new therapies to prevent or slow progression of the disease. Previously, research in Quaggin’s laboratory and others had suggested that the dysregulation of an important vascular signaling pathway called Angiopoietin-TIE2 (known as TEK in humans) plays a key role in the progression of diabetic kidney disease. In the current study, Quaggin and an international team of collaborators investigated approaches to restoring the pathway. “We thought that activating TIE2 — flipping on that switch — would be good because in other organs and diseases, it appears to make blood vessels happier and healthier,” explained Quaggin, also the Charles H. Mayo, MD, Professor. In the study, the scientists discovered that a protein called VE-PTP is highly expressed in the kidney blood vessels of diabetic mice, and that the protein appears to be a marker of injured blood vessels. They further showed that inhibiting VE-PTP restored TIE2 activity in mice, and protected the kidneys from damage due to diabetes. Beyond furthering understanding of the fundamental biology underlying diabetic kidney disease, the findings also have important therapeutic implications. “There are already preclinical molecules and drugs in the market that target VE-PTP and the TIE2/TEK pathway to treat eye disease. Our study suggests they might be valuable for kidney disease, too,” Quaggin explained. In future research, Quaggin, together with The Northwestern University George M. O’Brien Kidney Research Core Center (NU GOKidney), will also explore whether these results extend to other diseases. In separate research published in Nature Communications, Quaggin was also the co-author of a recent study that identified an enzyme called GSK3 as a critical regulator of podocytes — highly specialized cells in the kidney’s glomerulus — and thus kidney function. The Journal of Experimental Medicine study was supported by grants NIHR01HL124120, T32DK108738, NIHR01EY025799 and P30DK114857. Imaging was performed at the Northwestern University Center for Advanced Microscopy supported by NCI CCSG P30 CA060553 awarded to the Robert H. Lurie Comprehensive Cancer Center. The genetically engineered mice were generated with the assistance of Northwestern University Transgenic and Targeted Mutagenesis Laboratory (NIH grant CA060553). The metabolic analysis was supported by the Comprehensive Metabolic Core at Northwestern University. Quaggin holds patents related to therapeutic targeting of the Angiopoietin-TEK pathway in ocular hypertension and glaucoma and receives research support, owns stock in and is a director of Mannin Research.